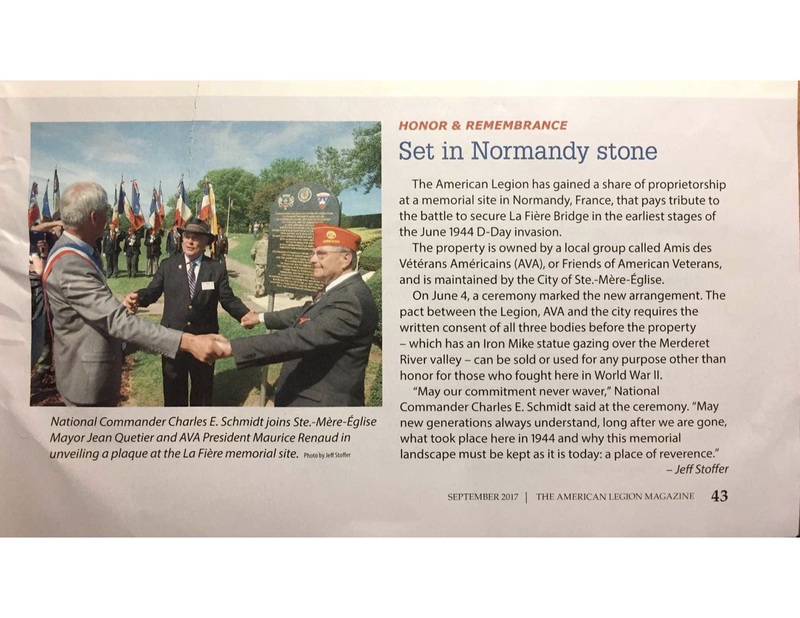 The American Legion has gained a share of proprietorship at a memorial site in Normandy, France, that pays tribute to the battle to secure La Fière Bridge in the earliest stages of the June 1944 D-Day invasion. The property is owned by a local group called Amis des Vétérans Américains (AVA), or Friends of American Veterans, and is maintained by the City of Sainte Mère Église. On June 4, a ceremony marked the new arrangement. The pact between the Legion, AVA and the city requires the written consent of all three bodies before the property – which has an Iron Mike statue gazing over the Merderet River valley – can be sold or used for any purpose other than honor for those who fought here in World War II. "May our commitment never waver", National Commander Charles E. Schmidt said at the ceremony. "May new generations always understand, long after we are gone, what took place here in 1944 and why this memorial landscape must be kept as it is today : a place of reverence."